We held a Think Tank event in Manchester on 14 November 2017 to inform the research for this project. The event was attended by 21 participants from 17 different organisations (mainly universities but with government and professional bodies also represented). Discussions were conducted under the Chatham House rule and the following is a summary of the outcomes. Adrian Anderson, chief executive of the University Vocational Awards Council (UVAC) set the scene by discussing the background and policy context to the introduction of the new apprenticeship standards. The government definition of an apprenticeship specifies that it is a ‘job’ not a qualification. It is a job that involves a programme of training designed to enable the individual to gain the knowledge, skills and behaviours needed to become competent in a defined occupation. This is a very different approach to how we think about most of the education we deliver. We need to be wary of talk about ‘exponential’ growth in the number of degree apprenticeships as that growth started from a very low base. Apprenticeships are also not providing a ready progression route into higher education as the number of level four and five apprenticeships is currently very low. Many HE courses are currently offered due to student demand, there is concern within the sector that employer demand will be significantly different and therefore require substantial review and changes. We are faced with a situation where the employer is the customer and providers will be judged on employer satisfaction to a much greater extent than learner satisfaction. Similarly, HEIs will need to be marketing to employers and offering a different kind of package to the marketing they currently do to individual students. Providers are having to adapt to a different statutory framework and in particular one that is founded on more of an inspection basis than the trust basis we have in HE. Gill Ferrell talked about the outcomes of the project to date highlighting some of the potential implications for universities and colleges and some of the observations made in discussions with the sector. The pain points as indicated by survey responses to date were highlighted and discussed. Employer design groups are now in the driving seat and there is concern in the sector that providers have not always been sufficiently involved in the design of both standards and assessment. It was suggested that the design of some degree apprenticeships is simply too long and too challenging for students who already have demanding jobs e.g. a 6 year course for solicitors . A good design academically would be likely to offer more flexibility/stepping off points with interim qualifications but this is not how the apprenticeship standards work. Some institutions have tried to adapt what they already do rather than changing how they work and they are finding that fitting approaches to areas such as grading, marking and academic regulations to existing procedures is extremely difficult. Designing learning that involves collaborative group work and peer review is more challenging in this context. In some subject areas there is so much concern about confidentiality that people are veering away from collaborative work and action learning sets altogether. It is the case that student peers may work for employers who are in direct competition with one another. It is also harder to design peer work when students are outwith the ‘safe’ environment of the classroom. N.B. some participants questioned whether students already in work actually have the same need to undertake peer work as other students. This was a minority view and most participants recognised peer work as particularly beneficial to apprentices even if it is not specifically required by the standard. There can be issues around the academic ownership of student output. There was considerable discussion about approaches to learning design i.e. whether to adapt existing offerings (brownfield site) or start again. Many people appeared to be trying to adapt existing offerings and finding this difficult but few participants felt they were really given the time to redesign from scratch. There was criticism that some online offers are of poor quality (and are indeed being rejected by savvy employers). It was suggested that some design of apprenticeship courses falls into the same trap as some online/distance learning i.e. not realising how different the audience and their needs actually is. It was noted that there is a lot more work involved in delivering apprenticeships because you are having to deliver a set of knowledge, skills and behaviours and liaise with employers on top of everything you would normally do for a degree. There is a serious lack of clarity around EPA at the moment (some went so far as to describe the situation as chaotic) and in many cases providers do not know who will do the EPA for students currently on programme. There is a feeling that statutory bodies and policymakers are naive about providers’ ability to design learning geared towards an EPA that is not yet well defined. Some HEIs reported that they are working with external EPA providers who keep ‘moving the goalposts’. The limited choice of EPA centres is being compounded by the fact that some centres are already closing down. There are a number of different roles involved in the relationship between employer, provider and learner (e.g. line managers, mentors, finance and legal teams at both ends) making it different to, and more complex than, the usual relationship between an institution and its students. There may also be other delivery partners and external EPAs. Each of these stakeholders may have different expectations and there can be tensions in negotiating the formal contract between them e.g. employers may want to use contracts that don’t fit the funding rules or comply with HEFCE good practice. Employers take the view that they are procuring a service and they are in charge whilst HEIs are concerned that they are carrying the risk of delivery. There can be a lack of clarity about exactly what the 20% off the job element of the apprenticeship actually consists of and tensions around releasing apprentices to undertake study. HEIs are worried about what will happen if they are audited and the evidence of 20% off the job learning is not deemed to be adequate. There are particular issues for employers who work with multiple universities and find the approaches very different. Participants raised a particular query about how apprentices with the same employer but studying in different universities would perceive differences in assessment practice. Apprentices with different employers can have very different support hence we are starting from a position where there is not a level playing field and equity in terms of support for learners undertaking the same degree. Mentors in the workplace often have significant staff development needs as the skills required for the mentoring role or not the same as those needed for their day job. There is a cost associated with this. There are many issues around meeting employers information needs. Relationships are very different and universities talked about employers asking for information about apprentices that the university cannot ethically provide. The need to work with employers throughout the whole period of the apprenticeship from initial recruitment through ongoing progress checking, monitoring and review was noted. Course leads may not be particularly interested in employer needs as they see their educational role as much wider than this. Academic aims may differ from employer needs e.g. employers might not see the development of critical thinking skills as a priority if they cannot see why apprentices need the skills to be able to do the job. Questions were raised about the impact on TEF and other metrics, such as NSS, if apprenticeships and other degrees are not viewed separately. There are issues around meeting statutory and funding requirements that have grown out of FE and which HE sector corporate systems were not designed for. Even fundamental processes such as student enrolment are different. Many institutions have muddled through with ad hoc solutions that were satisfactory when apprentice numbers were very low but these solutions will not scale up effectively. There is a need for a shared online environment with employers. There are data integration issues, compounded by a lack of institutional understanding about the whole degree apprenticeship data model and data flows. Our current systems are based on quite rigid models. There is a proliferation of systems, technologies and processes within the institution leading to complexity and duplication of work. Students are overburdened with multiple technologies e.g. the VLE e-portfolio, assessment tools, submission system etc. The relationship to professional body accreditation requires integration with further systems in many cases. Software licensing throws up many issues as there are tensions between academic and commercial use. We don’t currently have systems for measuring employer satisfaction. There are many concerns over data integrity. Staff development needs are high and there are significant workload issues. Budget structures are different to traditional programmes and finance systems struggle to cope. We also identified many examples of good practice in addressing some of the issues raised above. These will be followed up with the institutions named and used to inform further guidance. These are some of the suggestions for activities and outputs that could help the sector. Create structured tools for curriculum design that are specific to apprenticeships addressing the role of the standard and knowledge, skills and behaviours. Also guidance on how to approach curriculum design and how to review your designs. A work-based learning or version of the Viewpoints cards was also suggested. Create a mapping of the academic development cycle matched to the standards life cycle. Guidance on EPA and how to interpret different elements of the EPA e.g. what types of assessment might fall under the heading ‘exam’? Guidance on issues relating to data management and GDPR particularly: partnerships, online assessment, data theft, release of confidential data by students, what information you can supply back to employers. Guidance on effective use of e-portfolios. Feed examples of authentic assessment back to the wider community. HEIs could use help in managing expectations to ensure successful delivery. There is also a critical lack of user support about what apprenticeship actually is and the roles and responsibilities involved. Provide a glossary of terms to facilitate conversations (see the Jisc COGENT project). It would be useful to have a map/infographic of the relationships covering topics such as: roles; tensions; relationships; information flows; responsibilities; accountability; communication needs; statutory requirements. Jisc could create a generic map onto which institutions could map their own relationships. 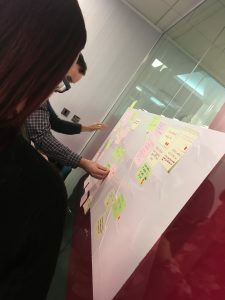 It would be useful to see an idealised communication approach based on what has been shown to work with employers showing the information flows, connections and loops and examples of the systems and tools that have been used to deliver this. Provide an online service for managing the relationship with employers that includes facilities for digital signatures and is linked to the ULN and DAS. HEIs could use help in developing a common understanding of technical infrastructure, information flows, and data management relating to degree apprenticeships. Develop a reference model for technology. Provide guidance on integrated VLE and E portfolio solutions. Create an employer satisfaction toolkit. Posted by Gill Ferrell on January 5, 2018 in toolkit and tagged degree apprenticeships, higher apprenticeships.